It was around 3pm in the afternoon when we arrived at the Ijen National Park, East Java, Indonesia. We were passing through a coffee plantation when Wahid, the driver of our tour suddenly broke the silence. "But that's not because of its' caffeine, but it's because of its hefty price!" 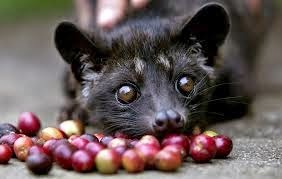 Indeed, the famous civet-poop coffee, locally known as kopi luwak, could cost up to 150,000 rupiah (US$12.40) per cup. And the exorbitant price tag has prompted locals to start trapping wild civets and keeping them in small, congested cages to get involved in this lucrative business. "So where are the luwaks? Is there any luwak farm around here?" I asked. I have long heard about the beverage and the horrible treatment endured by the animal via documentaries I watched when I was little, so I was really eager to see for myself the true extend of the claim. "No there is no luwak farm here, only coffee farm..." he replied. He then murmured something which I couldn't catch properly, presumably reluctant to shed more light on that question. His reticence was understandable, though, given the widespread criticism made by animal-advocate groups especially on its inhumane treatment of the civets. Over the past 20 years kopi luwak has become the ultimate bling coffee, a celebrity in its own right, stocked by every aspiring speciality retailer worldwide, and appearing on CNN News and Oprah. The origin of kopi luwak is closely connected with the history of coffee production in Indonesia. Coffee beans that have passed through the digestive tract of this cat-sized creature native to southeast Asia will be denatured by their digestive enzymes and thus altering the final taste, and make a remarkably smooth brew, producers and aficionados say. Palm civets are primarily frugivorous, feeding on berries and pulpy fruits such as figs and palms. Civets also eat small vertebrates, insects, ripe fruits and seeds. Initially, civet coffee beans were picked from wild civet excrement found around coffee plantations. This unusual process contributed to its rarity and subsequently, its high price. More recently, growing numbers of intensive civet "farms" have been established and operated across Southeast Asia, confining tens of thousands of animals to live in battery cages and be force-fed a debilitating, nutritionally deficient diet of coffee berries. A 2013 investigation by People for the Ethical Treatment of Animals (PETA) Asia found wild-caught civets on farms in Indonesia and the Philippines. The animals were deprived of exercise, a proper diet, and space. Video footage from the investigation shows abnormal behaviours such as repeated pacing, circling, or biting the bars of their cages. The animals often lose their fur. Tony Wild, the coffee executive responsible for bringing kopi luwak to the Western world has stated he no longer supports using kopi luwak due to animal cruelty and launched a campaign called "Cut the Crap" to halt the use of kopi luwak. A group of food scientists have recently recreated the fermentation process that mimics some of the changes that occur in coffee beans as they wend through a civet's digestive tract. They have since started a company called Afineur, and they hope to start selling the artificial kopi luwak soon. After checking in my luggage at the Ngurah Rai International Airport in Bali, I took a walk around the airport's massive hall. I soon found myself wandering around the departure hall and there, right next to the chocolate kiosk, stood a kopi luwak kiosk. $45 for 100g of coffee powder. Should I get a box for my coffee-loving mother? Well, there are many other types of coffee to choose from. I decided to not to support this heinous act of animal cruelty.